That title is the best I could do, because these are not exactly brownies. Although the ingredients are about the same, this technique is easier than melting chocolate and mixing by hand. Use a mixer for the dough and bake in a foil-lined pan for easy clean-up. I find this more pleasant than dropping bits of cookie dough on a baking sheet and obsessing over whether they’ll be too gooey or too crisp. These will have a crispy crust and a gooey center!! Preheat Oven to 350 and line an 8X8 baking pan with foil, leaving extra “handles” for easy removal after baking. In a large mixing bowl, cream eggs with sugars. Add eggs & mix until fluffy. Mix on low while adding soda, salt, Starbucks VIA, cocoa, buckwheat, and flour. Add the extracts, chocolate chips & 1/2 cup almonds, mixing briefly. Spread batter evenly in pan and top with 1/8 cup almonds. Bake about 23 minutes. Allow to cool, then use foil handles to remove from pan. Cut into 25 pieces and press one chocolate almond into each piece (optional). If you’re a chocolate lover, it might be a good idea to double this recipe for a 9X13 pan!! Does anyone in your family like Reese’s Peanut Butter Cups? Well…this is the ADULT version, but the kids will like these BETTER, too!! They’re made with rich dark chocolate, organic peanut butter, and freshly ground peanuts. You won’t go back!! Melt butter. Put confectioner’s sugar in a small mixing bowl and pour in butter while mixing. When well combined, add peanut butter and mix until smooth. Line a 9X9 baking pan (or 8X8 for thicker bars) with waxed paper, leaving extra paper to grasp for easy removal. Press mixture evenly into pan and allow to cool slightly. In a measuring cup, microwave the 60% chips in 15 second increments, stirring in between each heating, until chocolate is just melted. Chop 85% chocolate into small pieces and add to melted chocolate. Keep stirring until chocolate pieces are completely melted. This can take some patience, but if done properly will give a shiny tempered chocolate finish. (See note below about using Melting Chocolate Wafers instead). Spread the melted chocolate evenly over the peanut mixture and top with chopped peanuts. Allow to cool thoroughly. When the chocolate is completely hardened, remove from the pan by grasping the waxed paper “handles.” Turn the chocolate side down on a cutting board and peel off the waxed paper from the bottom. With a large chef’s knife, cut the bar in strips and then in uneven triangles or squares as desired. Don’t worry if the chocolate breaks unevenly – see the photo! Store in an air tight container. Do NOT refrigerate. p.s. Any combination of chocolate will do. I like an extra dark flavor as above, but you could substitute 8 oz of Ghirardelli Melting Chocolate Wafers which consistently give a shiny, tempered chocolate look and are easier to work with, although they are a bit sweeter. Pure comfort. Bite into one of these and your Winter Blahs will disappear!! Preheat Oven to 350 and line 8X8 baking pan with foil. Cream butter & sugar, add egg, and continue mixing until light and fluffy. Add almond & vanilla extracts, baking powder & salt. 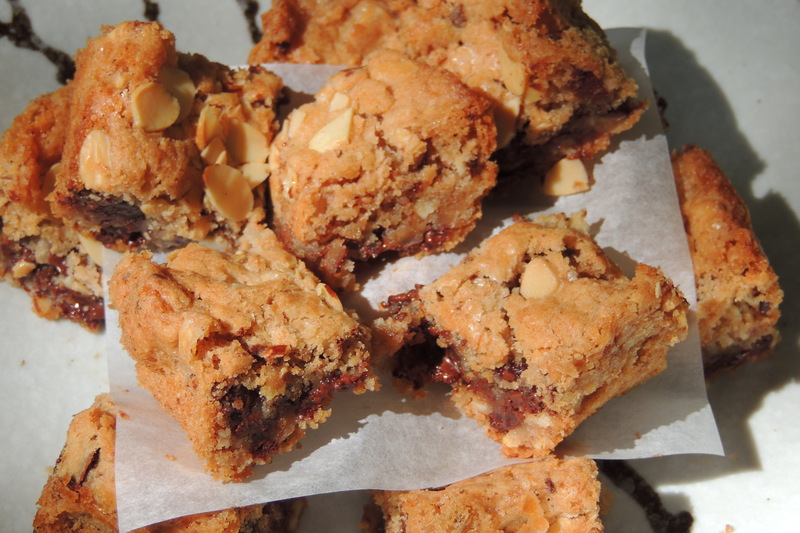 Add almond meal, flour, chocolate chips, coconut & 1/2 cup sliced almonds. Mix until combined. Press into prepared pan, sprinkle with 1/8 cup sliced almonds and bake about 20-25 minutes until lightly browned. Cool completely, remove from pan along with foil, and cut into bars. Makes 25 small bars.